One of the hottest trends in promotional products is the PopSocket. Just in case you don’t know what a PopSocket is, we’ll explain. PopSockets grips are small, plastic contraptions that adhere to the back of your phone and “pop” up to use. They are made of three parts: a decorative disc, a flexible accordion-like stem, and a circular base that sticks on your phone. Cell phone accessories are like the modern-day billboard. Did you know that the average person makes 8,000 estimated public texts and calls per year? * That’s advertising space seen by 67 times more people than a Super Bowl commercial! Mobile phones are easily one of the most valuable pieces of real-estate for your brand – and PopSockets are one of the fun, new ways to earn that placement. Small children are not the typical Verizon or T-Mobile customer, and they are probably not your customer base. But if their parents and grandparents are your target audience, gifts for their young kids are a great way to reach them! When phones are used by children to keep them entertained and engaged, your brand will be remembered as one that regularly gives the gift of peace and quiet. Watching Movies: Kids often require entertainment at restaurants while the adults engage in conversation. Yet they are young, and likely to drop their phone or their parents’ devices in the leftovers! When the PopSocket is extended, it’s the perfect stand to watch movies along with parental instructions of, “Don’t touch the phone.” This will hopefully end any arguments between siblings who want the phone right in front of them. Gaming: Kids need to make epic moves while gaming. One PopSocket is essential (and a pair of PopSockets are perfect!) for gaming, regardless of the device. Allow children to secure tablets, eReaders, and phones with both hands while playing games and apps. Videos: Tweens are less interested in texting and making phone calls and more interested in watching online videos. 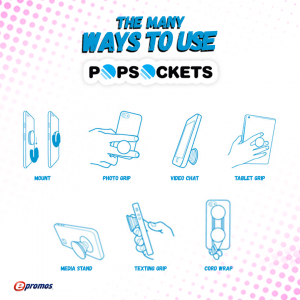 The PopSocket can be used as a video stand, both vertically and horizontally, no matter where the PopSocket is positioned on the phone. Tweens can watch short clips and entire episodes, without getting [enter snack of choice] on the phone. Music: Too often, kids leave their earbuds in a snarled mess resembling a series of intricate nautical knots. Two PopSockets make for a convenient earbud-management system your customers (and their kids) will certainly appreciate. When gifting these at your trade show booth or in-store event, show guests how to wrap the cord around the PopSockets so they are wired for sound in a snap…or a “pop”. Fidget Toy: Very recently, fidget toys have been all the rage for kids of all ages. The PopSocket makes a fun alternative for tweens, who can expel extra energy by flicking, popping, and spinning their way to relaxation. Kid tested, mother approved. Texting: Focus-group data collected by Pew Research Center last year shows that 80 percent of teens say they communicate with their closest friends by texting…up to 100 texts a day! Think about how many times they wanted to write a one-handed text? Efficient, right? PopSockets can make that happen. Selfies: PopSockets earned their popularity from being taken with selfies. The newest, must-have gadget provides an easy grip when users expand it like an accordion. This grip makes it easy to take selfies. 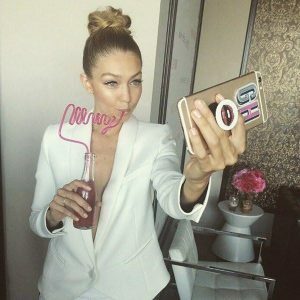 Look how easy it is for Model Gigi Hadid to take a one-handed selfie! Photos: “Hey, your thumb is in the way!” We are sure your clients have heard that before. And if not, we’re betting you’ve seen the stray finger on the out edges of photos yourself. A PopSockets grip is not only a fun accessory, it makes holding the phone easier, so photos are better. These tools are little life changers for your customers and brand ambassadors! eReaders: PopSockets make reading a book more comfortable to do. When hands get tired of propping up the pages in one position, recipients can remove the PopSocket by pulling slowly on the base, and then reposition and reattach time and time again. Your customers always have the exact grip or stand needed. Skype: Multi-tasking is essential during any Skype call. Your clients and business partners are taking notes, sending emails, and sipping coffee. They need to be in hands-free mode. The PopSockets mounting device provides the perfect way to see and be seen. Facebook: With a few minutes during commute to catch up on Facebook, the last thing your customers want to do is drop their phone in the subway or on the bus. A cracked screen is not worth viewing recently uploaded cat videos. Or maybe it is? We doubt it! Group Photos: Selfie sticks are extremely helpful when taking pictures that need a wider viewpoint. But if taking a group shot, there is not a selfie stick long enough to get everyone in the photo. Introducing the PopSocket as a tripod for a phone: show recipients how to set the scene, set the timer, sit with the group and DONE! Smartphone Grip: Adults might like to think of themselves as more responsible than teens or tweens when it comes to respecting property. However, working through a busy crowd while texting or making a simple call could result in a minor collision and the dreaded screen smash. A firm grip is necessary to avoid catastrophes while multitasking, and a Popsockets grip makes it easy. Laptop Hook: Most of your target audience spend their days in front of a computer – but their phones are always close-at-hand. As many professionals habitually check their phones throughout the day, another great way to use the PopSockets is to expand the socket to hang the smartphone from the corner of the laptop or computer monitor. Now their phone is always in view. Viewing: A favorite pastime for grandmas and grandpas is to view photos that have been sent and saved to their smartphone. Whether using the stand or holding the smartphone with the PopSockets grip, photos can be easily enjoyed. This handy device is especially helpful when scrolling and flipping the device to view photos in portrait and landscape positions. Facetime: You know who loves Facetime? Relatives and friends who live far away. Nothing is more valuable to your customers than and catching up with a loved one face-to-face. During this special time, their hand is bound to cramp from holding the phone for such an extended period of time. Gift them the PopSockets grip to use as a kickstand, so they can chat away! Calling: Maintaining a steady grip on such a small device is sometimes difficult for older adults. You don’t want them to drop their phones. A big grip to hold onto will reduce their fear of dropping their expensive phone. ePromos sells the real PopSockets grips – there are no fakes here! Our products are the same PopSockets you see at retail stores everywhere. We carry single PopSockets or a combo package of a PopSockets and a mount…just like you’ll see in stores. When your company taps into current trends, your business will become cool by association. Products seen on retail shelves have a higher perceived value, so they make a more impressive gift. For certain audiences and industries, it can be the ideal way to set your message apart. When brand recognition is on the line and perception is key, PopSockets grips are a sure-fire way to make a lasting impression. Consider investing in these promotional products that you’ve seen in shops and stores for your next marketing idea.